UPGRADED for TRIPLE IMPACT: Newest 2017 Ultrasonic Pest Repeller with TRIPLE POWER: Ultrasonic + Electromagnetic + Nightlight function. Pests will now be scrambling to find a way out of your home! We have fine tuned the range of ultrasonic frequencies and increased their intensity so that ALL pests will be forced out of your home. EFFECTIVE WHOLE HOME PROTECTION: 2,150 SQ.FT per unit - Pest Repeller uses state of the Electromagnetic ultrasonic technology to drive pests away.Can flexiblely choose the ultrasonic frequency according it\'s dfferent using scenarios. 1 band: super electromagnetic ultrasonic insect repellent, 2 band: powerful ultrasonic insect repellent.Multi-frequency ultrasonic waves ensure pests and rodents do not become immune to the sounds.and forces them to leave your home. 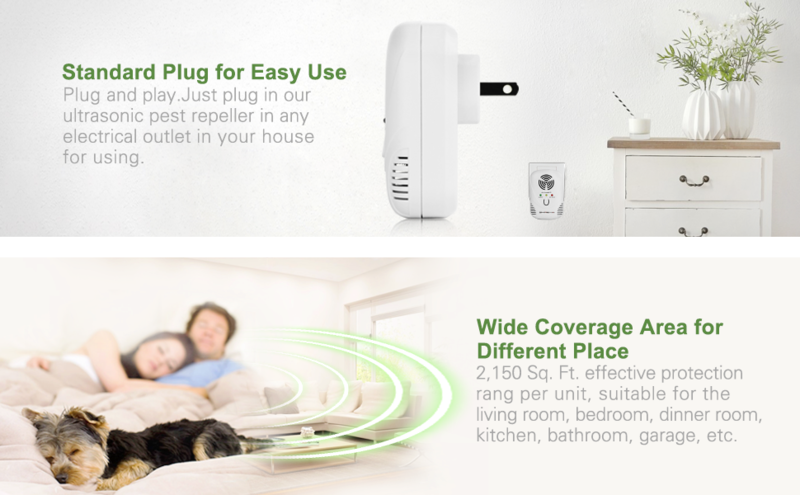 CHILD & PET SAFE: By leveraging advanced ultrasonic & electromagnetic Madpower Pest Repellent waves Pest Control that pass through your walls, furniture and ceiling, you can drive out bugs, mice, cockroaches, ants and spiders without worrying about children or animals. ECOFRIENDLY SOLUTION: Unlike glue traps, mouse traps or roach motels - all which kill bugs and leave a messy cleanup— our ultrasonic pest and mosquito repeller waves won’t cause harm or leave nasty dead insects or rodents behind for you to deal with. 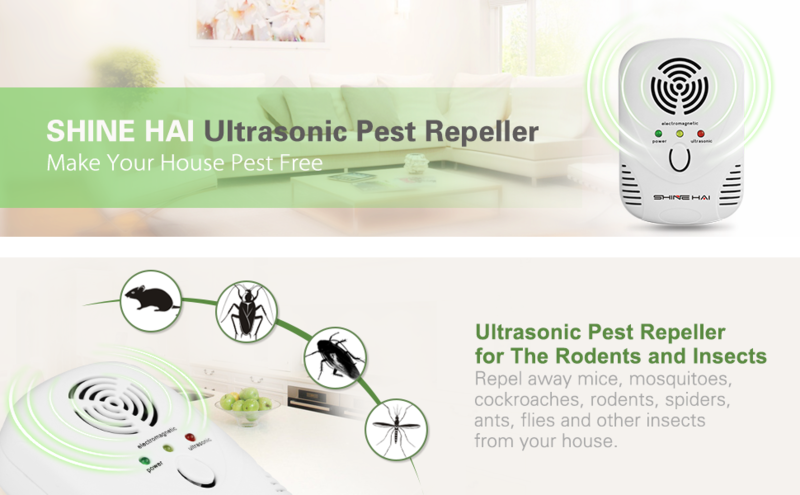 100% MONEY BACK GUARANTEE: If you\'re not completely satisfied, Return the ultrasonic pest repeller for a full refund! Place Your Order Now WITH CONFIDENCE and enjoy really great product. Are pests living and growing in your home, between the walls, in the kitchen, in the attic? Running around near your children, pets and food? Are you tired of spending hundreds or thousands trying to get rid of them? Don't worry! there is an economical, equally effective solution for you! Pest control ultrasonic is engineered with the latest technology. Just plug it into an electric outlet. Then simply relax on your couch and watch insects and rodents fleeing! SHINE HAI Ultrasonic Pest Repeller uses the latest technology with 2 bands to meet different needs. The 1st band is the ultrasonic wave of 25-70KHz, inaudible to humans, repel away the mice, cockroaches, spiders, ants, etc. The 2nd band is the bionic wave of 10-70KHz, wider wave than 1st band, repel away the mice, mosquitoes, cockroaches, spiders, ants, etc. Note: The 2nd band is audible to humans and pets. Kindly suggest to use the 2nd band in an environment of no one and no pets. 2)Environmental free : Throw away dangerous CHEMICALS, Traps Poisons, or sprays , poisonous, synthetic chemicals , insecticide , sticky tape , mousetrap ,DEET and more . 1)This machine should be installed at least 2.6 - 4 ft centimeter away from the floor . And should be vertical to the floor and plug to the outlet . 2)The installing point sound be avoided from carpet , curtain and attaching sound material ect . 3)It's normal that the mouse and vermin will increase at the beginning of the using days . Because they will get away from the living place after the attack of the ultrasonic. They will leave your house after a few days of using.